I hope this is in the right catagory ^^; the image I used was from a stationary set and I can't seem to find it. Oh well. Words are lyrics to Gyroscopes' "A Slow Dance". Large View quality is rather poor; please download to see the wallpaper in all it's glory! wow,It`s nice.And I love your idea there. I truly love the aristocrat feeling on this wall, the colors, characters and illumination are perfectly added on it like pieces of a puzzle. Truly beautiful! It won me from the very beginning. Just a slow dance, because life's like a slow one, I take off my hat to this beautiful wall. Immortal, I love it! x3 I hope you don't mind if I use it as my desktop. Quote by FyorenImmortal, I love it! x3 I hope you don't mind if I use it as my desktop. Oooo... This is so pretty! 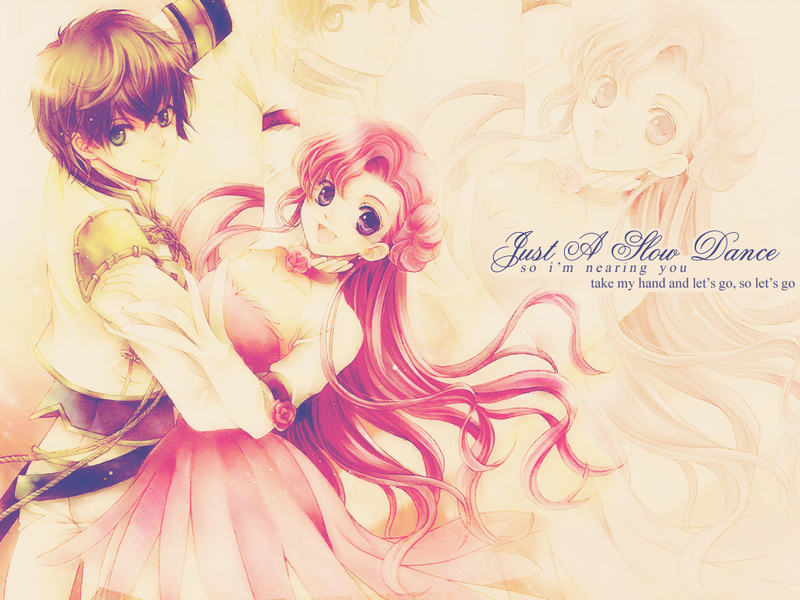 I love this couple in Code Geass. They seem more.... human, somehow. =X Does that sound strange? I mean, the rest are like super rich noble and crazy Geass users. lolz No offence, if I did offend anybody with this comment, then I apologize in advance! Gomen!